Meet the specialist for outdoor use The SM-T300 is a wireless, mobile, handy and robust direct thermal printer for difficult terrain. It is dust-proof and splash-proof meets the IP54 standard and the ideal choice for when the going gets tough. Capable of 8 hours of printing performance, this lightweight device also has simple handling to guarantee you reliable performance at all times. 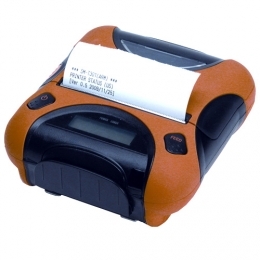 Use it for customer receipts and bills your multitude of demands are met professionally and dependably with its printing speed of 75 mm per second at a resolution of 8 dots/mm 203 dpi. Enjoy simple handling, independent of other devices, via its LCD display. Thanks to Bluetooth technology, wireless communication is a breeze. Its serial interfaces allow for changes to printer settings and configurations without hassle. Optionally there is a Wi-Fi model available with a magnetic card reader. It is compatible with multiple operating systems and integrates itself seamlessly into existing systems. Included in the delivery are a battery pack, power cable, serial cable, a practical belt clip and a sample roll.